I was frustrated after two years of trying to get the redactions removed from the access to information documents I’d received from the Department of Foreign Affairs concerning my cancelled art show in 2011. Within one week of receiving my letter (below), the OIC had started an investigation. It required an OIC investigator from their eight person team to investigate the high-level redactions which had been approved by the Head of a Government Institution. 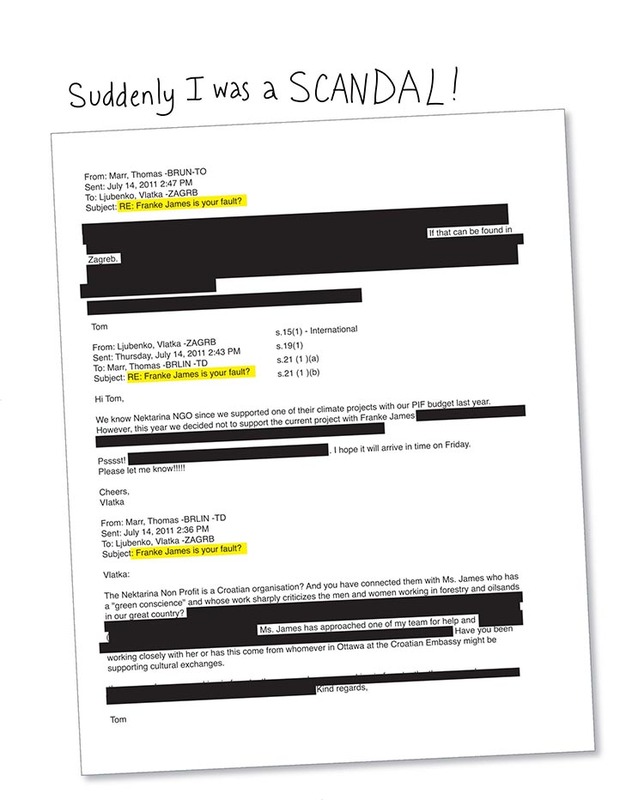 In mid-February 2015, I received the first batch of “un-redacted” documents from DFAIT. The OIC has succeeded in getting some redactions removed because DFAIT had redacted text using high-level clauses which were either incorrect or not applicable. The OIC investigation is still ongoing. I am very pleased to see that you are investigating the complaint regarding the muzzling of Federal scientists which was submitted by the University of Victoria Law Clinic and Democracy Watch. My case is related to the government’s muzzling of free speech. However I am not a federal employee. 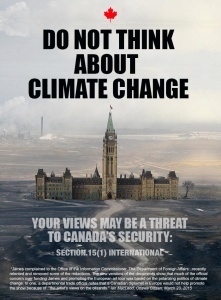 I am a Canadian citizen, an independent artist and environmental author, whose right to freedom of expression has been interfered with by the Federal Government. I am writing to request that you investigate my complaints which were submitted in December 2011 and April 2012. “Return of the Blacklist” by Charles Montpetit (pages 18-19), Freedom to Read 2013. The reason I was censored should make all Canadians angry — because it threatens the very essence of democracy: our right to speak up and disagree with our elected government. I am deeply concerned and frustrated by the delays on my complaints. As you know, “access delayed is access denied” and unfortunately, as the time drags on, my options on recourse become more and more limited. I face the loss of my economic rights and legal remedies. I have spoken with Eric Murphy several times as to the delays. His explanation was that the redactions under section 15(1) and 21(1)(a) and 21(1)(b), require a specialized investigator. That perplexing title comes from an email letter written by the Canadian Embassy Trade Commissioner, Thomas Marr [see below]. As you can imagine, reading that subject line and seeing the heavily redacted letter was a shock to me — and is still distressing. I think the average Canadian would agree that Mr. Marr’s letter is disturbing. And yet it is only one example of how the Federal government secretly interfered in my art show in Europe — causing its cancellation and the loss of a major business opportunity for me. I hope that you agree that my case is urgent and should be investigated now. 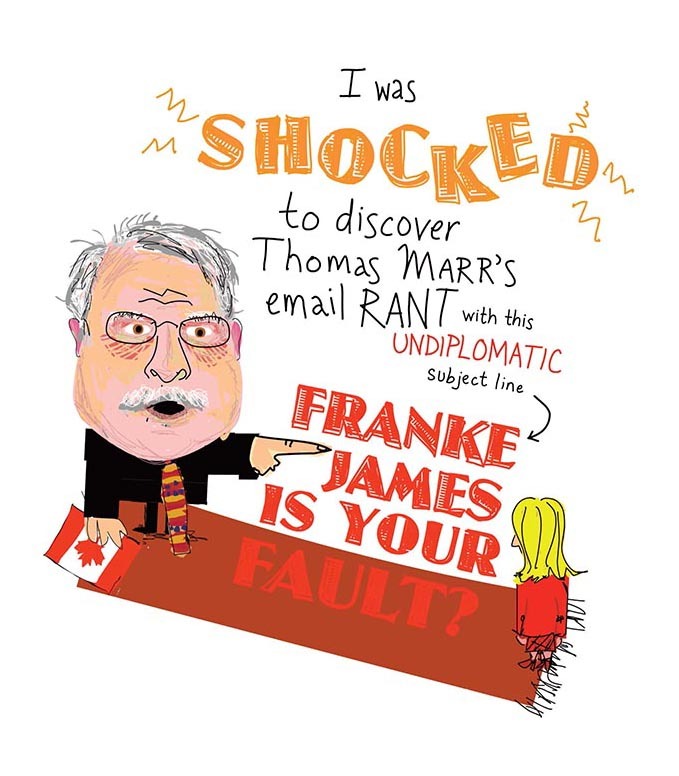 Read the full story: “Franke James is your fault?”. “What can one person do?” (pdf) proposed European art show in 2011, curated by Nektarina Non Profit.